When is a Flower Really New ?? When is a Flower Really New? THEY say there is nothing new under the sun. That is a very sweeping statement, and like most sweeping statements, not true. It would be truer to say there is very little new under the sun. And this would be as true of plants as of most things. We often speak of a "new" plant. 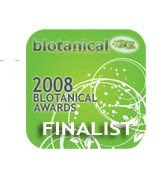 What we really mean is that the plant is new to us, or to our own horticultural world. But more often than not the plant is centuries—ages —old. In some part of the world it has been growing wild since before the time primitive man walked the earth. It may be new to the gardens of the world, or, what is more usual, to our country's gardens. A new plant is one that is new not only to horticulture, but to the world, and these plants may be obtained by an occasional "break" amongst wild plants, or a natural hybrid, by which is meant a plant that is the progeny of a cross occurring amongst wild plants, and resulting accidental cross-pollination between two related plants. Or again a new plant can be obtained by artificial cross pollination. These man-made plants are called garden hybrids, and are quite strictly "new" plants during an indefinite number of years, until, in fact, they have been distributed and grown in other gardens. We are getting very used to new plants in these days of specialised gardeners, who are frequently offering us new gladioli, new roses, new irises, new pansies, etc., etc. It takes something very novel or very beautiful, to give us a real thrill, but during the last few years I have experienced a real thrill out of seeing two new Bearded Irises. I saw them in Mrs W. R. Stevens garden at Wanganui, and realise they are not yet available to the gardener in New Zealand, but I believe they will become available within the next few years, and since a peep into the future is always intriguing, I should like to tell you about them. In fact I can do even better than that, for this month's "New Zealand Gardener" is illustrating one of them on its cover. This illustration is from a natural colour photograph. Having seen it I feel I should like to comment briefly on this colour plate. The plate is an extremely good one, but as in all colour plates I have seen the yellow appears to have gained a slightly orange cast. 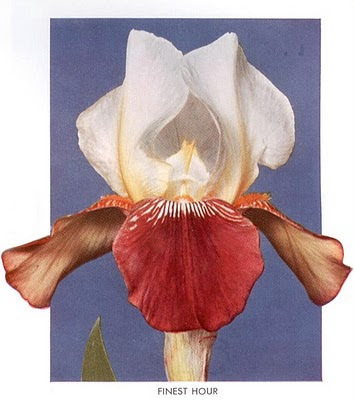 The name of the iris is Pinnacle, and it was raised by Mrs. Stevens. As I saw it the standards of the flower were dead white, and the falls light lemon yellow. This variety Pinnacle was what is called a planned cross, that is the breeder started out to raise just such an iris. The original parent was a creamy white flower, with faint gold pencilling at the shaft of the fall, and a series of crosses was embarked on with the idea of breeding a white and yellow bicolour iris. Pinnacle is the result of generations of breeding. Its lovely flower has most of the iris virtues in full measure, heavy substance, clean colour, lovely attractive form, and large size. Mrs. Stevens assures me it also has a good constitution, and is a quick increaser. The other new iris of which I promised to tell was, in fact, rather a new family of Bearded Irises, as there are quite a number now in this group of the ethereally lovely new pale pink irises. American breeders have made the greatest progress in this colour class, though the colour "break" has also occurred amongst the English raisers' seedlings. These new pale pinks bear no resemblance to what we have in the past called pink irises, that is, orchid pinks, or lilac pink with the warming influence of lemon or yellow undertone or blending. The new pinks all have pink buds, and share another feature also, a bright brick-red, flame, or tangerine beard. Of these pinks, the best are perhaps Dr. Loomis's Sea Shell Pinks, and Mr. Dave Hall's Flamingo pinks. They vary in the different named varieties, but all are definitely true pale pinks. Last year I saw one of Mr. Hall's unnamed Flamingo Pinks seedlings flowering at Mrs. Stevens. The colour of this was the colour of the flesh of a watermelon, with just that frosted iridescence. The lovely tangerine beard blends most sympathetically with the delicate toning. I understand that Dr. Loomis's, 'Spindthrift' is due to flower in this garden next November. In America it is rated the best of the Sea Shell Pinks. 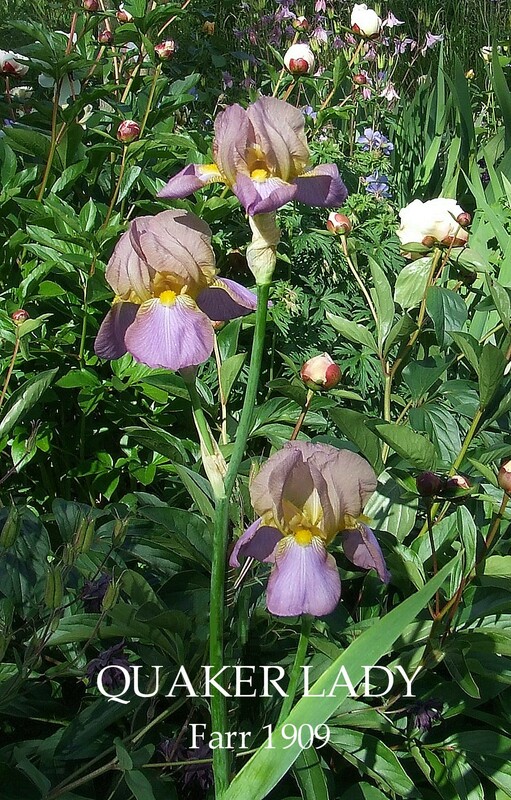 I believe Mrs. Stevens has embarked on a new line of crossing, combining these two new irises, and hopes in time to obtain a flower with white standards and pale pink falls. Such a combination, particularly if she manages to retain the tangerine beard, will be exquisite. "Irisarian" is one of the pen names used by Wally Stevens (Jeans husband) who also wrote under another pen name Silver Birch. 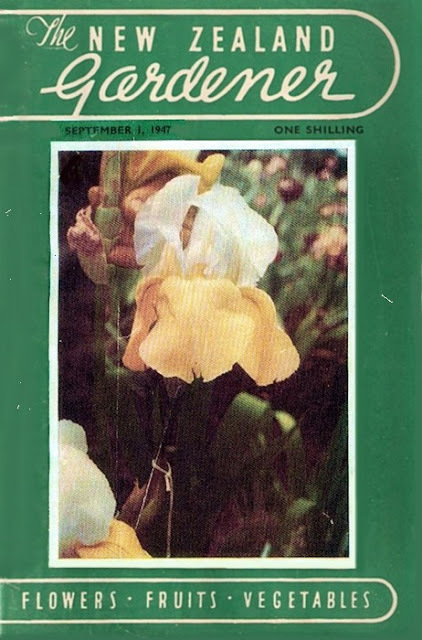 The above photo on the cover was in all probability the first published image of "Pinnacle" and the first introduction of the variety to the gardening public published 2 years before its international coordinated sale in 1949 by Stevens Bros. for the New Zealand and Australian market, Schreiners for the North American market , and Orpington Nurseries and Co. for the English market, all of this some 2½ years before the inception of the New Zealand Iris Society. Big Top hat tip to fellow blogger Gareth Winter for his considered thoughts and help. Tall Bearded Iris "LACED COTTON"
Laced Cotton is a Schreiners recessive white with a delicate and ruffled chiffon appearance,which belies its super substance and resistance to moderately bad weather conditions. Considered by some to being a Cool or Cold White its ruffling adds a warmth and another dimension to the bloom. I have listed two catalogue entries from Schreiner, the original Introduction in 1980 where it states pure white, and the 2000 catalogue description that mentions a very faint lavender-orchid tint when blooms first open. Grown at home alongside a reasonable planting of the herbaceous peony, Festiva Maxima, (Mielles, 1851, an historic fragrant white double, with occasional crimson flecks on petals). Our purely accidental planting does make a great visual combination. 'Laced Cotton' was registered in 1978, so is now unbelievably classified as a Historic Iris. Schreiner's, Salem, Oregon, Iris Lover's Catalog,1980 . LACED COTTON (Schreiner 1980 ML. 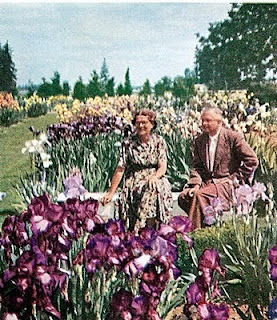 36"
Schreiner's, Salem, Oregon, 2000 Iris Lover's Catalog, Collectors Edition. LACED COTTON (Schreiners 1980) ML 36". This heavily laced white is immaculately clean and yet so daintily ruffled like exquisite Belgian lace . The huge 6" flowers actually have a very faint lavender-orchid tint when they first open. With three branches and 5-6 buds. Honorable Mention 1982, Award of Merit 1984. LACED COTTON (Schreiner's, R, 1978). Sdlg. I 551-1. TB 34" (86 cm) ML. Ruffled and laced pure white self; lemon to near white beard. E-275-A: (Crinkled Joy x B 696-AA) X Grand Waltz., Schreiner's 1980. High Commendation 1979, Honorable Mention 1982, Award of Merit 1984. In New Zealand it can be purchased from Julie May at The Iris Garden Christchurch, and thirty years plus from the date it was first registered in the USA it is still been offered for sale by Schreiners today,which in and of itself is an amazing accolade. 'Paul and Mary' is a Intermediate Bearded plicata Iris in which the pollen parent has dominated the form and colouration of the bloom. Having good increase as a plus it quickly makes a stunningly floriferous display. Blooms are subject to slight sun fade which is overcome by its bold colouration and waxy petals also making the blooms long lasting. The overall effect is a bright clump that has a airbrushed fade effect. Branching is good and well spaced. A child of the sixties with Wilma Greenlee's, 1968 SNOW CHERRIES , a white ground, rose-red intermediate plicata as the pod parent and WILD GINGER 1960, Jim Gibson's Tall Bearded classic ginger brown and creamy white plicata of good form fertile both ways, providing the pollen. Bred in New Zealand by the late Paul Richardson, of Upper Hutt and was registered by his wife Mary in his memory. Paul was a past office holder and stalwart of the New Zealand Iris Society. Placing this Iris unlabelled on a clubs sales table with a $2.00 price tag, could never remotely be considered as 'Introduced'. Another part of this puzzle is how a classy iris that was only registered eight years ago has received no published references in New Zealand including Iris Society publications, either critiqued or visual apart from a checklist entry, and the plant itself just disappears. An unusual way you might say to show respect to the hybridiser. PAUL AND MARY (Paul Richardson, deceased, by Mary Richardson, R. 2002). IB, 26" (66cm), ML. S. soft greyed yellow (RHS 162B); F. white, deeper yellow (162A) border lightly dotted golden buff (164B); beards bright yellow to orange. Snow Cherries X Wild Ginger. This Iris is very welcome to bloom in my garden any time and I would be more than proud to say I owned it. The more pleasing aspect is that after eight years from its registration, New Zealand gardeners finally get to see an Iris of pure class. I guess as the old saying goes "the cream will always rise to the top". A big hat tip to Mary Richardson for her detailed colouration description included in the registration which made the initial identifying of "Paul and Mary" just a whole lot easier. As an aside, two days after this post I receive a fantastic letter from Mary Richardson confirming the authenticity of "Paul and Mary" and in the same mail a very good Iris friend who has been completely oblivious to this posts investigation sends me a start of "Wild Ginger." I am twice blessed. Tall Bearded Historic Iris "QUAKER LADY"
It is my opinion, no historical Iris collection is complete without "Quaker Lady"
I like to think this iris is part of my Table Irises collection. Smaller flowers on zig-zag branching but makes up for the limited bud count per stem by being a vigorous grower that clumps up well, quickly producing multiple flower stalks in turn creating a mass bloom effect. The photo I hope captures the beauty of this classic and subtle diploid Iris. Quaker Lady. Standards bronze, touched with lilac. Falls smooth bronzy-mauve, with a gold centre to the flower. Very attractive. Mid season 2½ ft.
Color effect a smokey lavender, ageratum-blue, bronzed and blended bicolor. S. pale purplish vinaceous, of silky surface texture, bronzed throuout. F. mauvette to deeper ageratum-violet, bronzing at the edge and becoming yellow-olive on outer haft. Reticulations deep gold to olive brown. The beard is fine, projecting, and yellow-orange, and the styles are cream-buff tinged at the base. The growth is vigorous, and the plant has lax, slender,deep yellow-green leaves, tinged at the base. The flowering stalks are freely produced, above medium height, well branched, and carry their numerous blooms in a fine mass. The soft, smokey lavender, blending with old gold in the fair-sized, firm-textured flowers, is very pleasing when used in mass with bright yellows. This variety is a late bloomer. Rating 84. Lee R. Bonnewitz Catalog,Van Wert, Ohio,1928. This beautiful medium sized Iris has been most appropriately named, for its colors remind us of a Quaker Lady of old schools. The colors, while not striking, are very attractive, for the standards are a smoky-lavender shaded somewhat with yellow, and it's falls are blue and old gold was bronze and yellow markings. It has a splendid orange beard. When grown in front of the stately MADAME DURRAND the combination is most excellent. We recommend it on account of its beauty, its ability to multiply rapidly, and its great vigour. QUAKER LADY TB 27" M S3L,(Farr, 1909) Class VI a (1) AAA 142 (SQUALENS x pallida)RHS CLASS VI description is as follows; Varieties with standards of shot shades, that is, of any shade due to a mixture of two colours of which one is always yellow, the yellow being always evident at the base of the standards. The subdivision of the class are according tp the predominance or otherwise of the yellow. 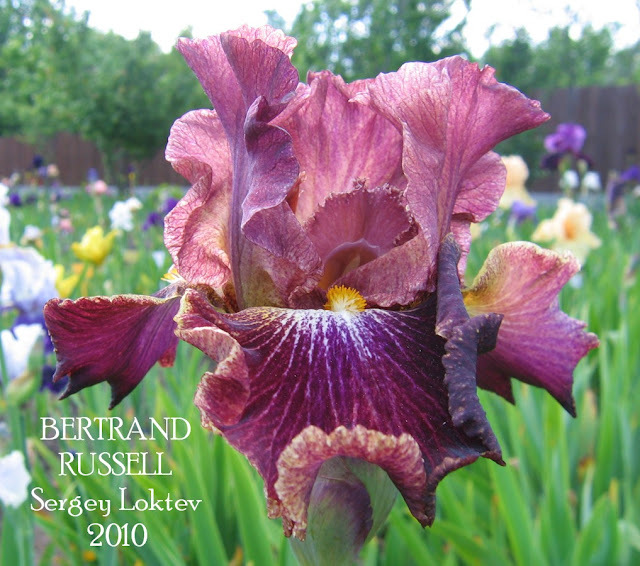 In New Zealand it can be purchased from Julie May at The Iris Garden Christchurch, also available in the USA from Iris City Gardens, 3 rhizomes for $15.00 which to me sounds like a very good deal. .
Sergey Loktev 2010 Iris "BERTRAND RUSSELL"
Heritage Irises are privileged to display for our visitors three of the many 2010 Introductions By Sergey Loktev of Russia. This Tall Bearded Iris has a look tailored for the discerning Iris grower with multi choice requirements all packaged into one bloom that plays with the light of day, and as we are all aware there is no time limits on Dreams, so we can look forward to more Irises "From Russia First Class"
BERTRAND RUSSELL (Sergey Loktev, R. 2008). Sdlg. 02-571-4. TB, 35" (90 cm), EML. S. creamy light yellow heavily washed smoky beetroot; style arms yellow, beetroot crests and midrib, crests fringed; F. cherry shot with black, white rays around beard, light olive pencil rim, lilac and brown dots on hafts and beside beard; beards white tipped yellow. Edgar Poe X 96-L15-22G: (”Depeche Mode”: (Rancho Rose x Sketch Me) x Flights of Fancy). Photo credit and copyright and My big hat tip to Sergey Loktev. 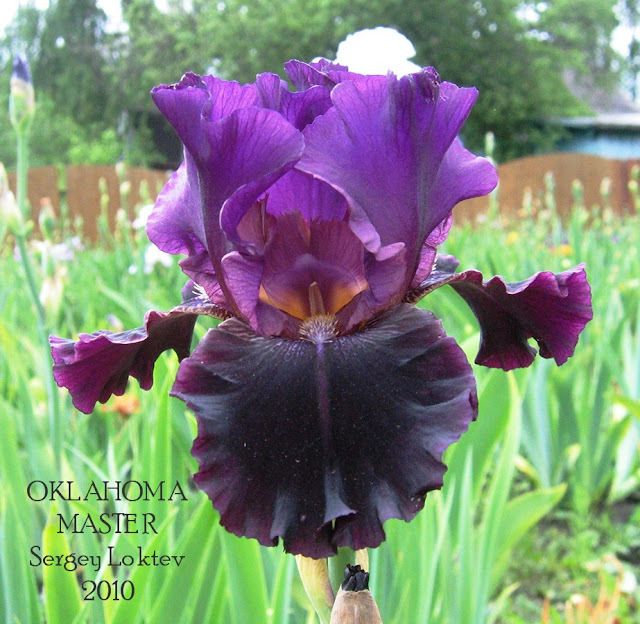 Sergey Loktev 2010 Iris "OKLAHOMA MASTER"
Heritage Irises are privileged to display for our visitors three of the many 2010 Introductions By Sergey Loktev of Russia. Second up today an attention grabbing Border Bearded Iris in purple-black with just the right amount of ruffling. I mean lets face it no other plant that can be grown by any level of Gardener, could put on a "Knock your socks off display"in Black, as well as the Bearded Iris. OKLAHOMA MASTER, SMB (i.e.BB according to AIS version), 00-700-3: (ROCKET MASTER x OKLAHOMA CRUDE). Photo credit and copyright Sergey Loktev. Sergey Loktev 2010 Iris "PEACOCK EYE"
First up today the aptly named Intermediate Iris which shows good form with unusual but striking colouration. PEACOCK EYE, IMB, 04-280-5: (ROAD TO HELL x ROYAL OVATION). 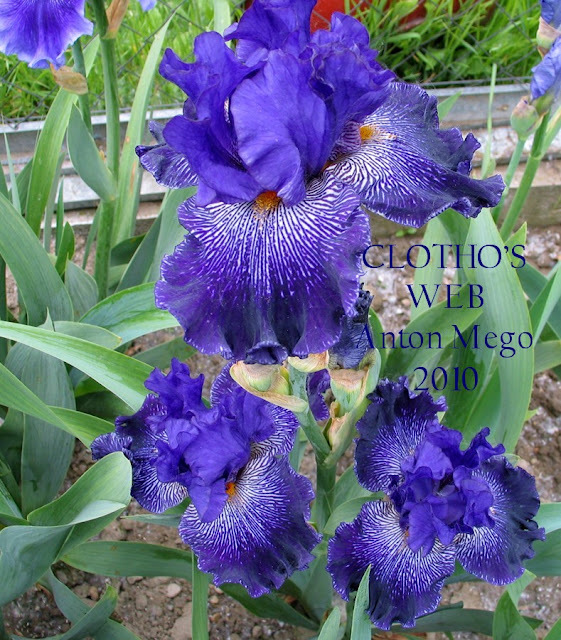 Anton Mego 2010 Iris "CLOTHO'S WEB"
Anton Mego 2010 TB 88cm M Sdlg AM-02/1000-2 wavy Slight sweet fragrance Standards blue near beards white stitched: Style Arms blue; Falls blue petals are from beards to ⅔ stitched with white veins spare part petals is blue purple, edge is patchy stitched with gentle white comas. Major Hat tip to Anton Mego, and it is an absolute privilege to help you get the profile that you so justly deserve. Well done mate!!! 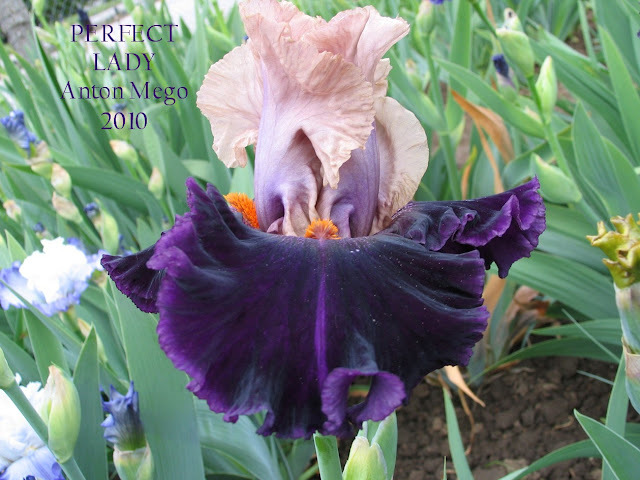 Anton Mego 2010 Iris "PERFECT LADY"
Anton Mego 2010 TB 88cm EM Sdlg AM-00/0708-2 Slight sweet fragrance; Standards light pink from beards to midribs draws gentle violet neon: Style arms light pink; Falls Black purple, close to midribs paler violet band, edges of petals are paler purple violet; beards red. Anton Mego 2010 Iris "ZLATOVLÁSKA"
Anton Mego 2010 TB 96cm ML Sdlg AM-02/0933-1 extremely wavy petals small horns Slight sweet fragrance; Standards blend of smoky yellow and brownish cream: Style arms creamy yellow, lavender above stigma; Falls lavender going yellow to the edge , Yellow reverse; beards yellow with light blue horns. Anton Mego 2010 Iris "BRATISLAVAN PRINCE"
Anton Mego 2010 TB 78cm ML Sdlg AM-00/0559/9 wavy petals tough texture Slight sweet fragrance; Standards light orchid lavender with huge creamy brown border: Style arms lavender silver with creamy brown edge; Falls Dark velvety blue purple,edge of petals with a few of white fibrils, close to beards small white field stitched purple brown; beards brick carrot. ALL THE BEST FOR "2010"
A GLIMPSE OF OUR DISPLAY GARDEN. Pictured below is a portion of our display garden photographed in May 1956. The visitors are Mrs Jean Stevens The President of the New Zealand Iris Society and Marion Walker President of the American Iris Society, Mrs Stevens is the noted antipodean Iris hybridizer whose very original creations (such as Pinnacle, Polar Cap, Mystic Melody), it has been our privilege to introduce in recent years. And we are impatiently awaiting the first bloom here in America of her new red and white amoena, 'Finest Hour'. Last year at iris time Mr. and Mrs. Stevens made their first trip to the United States, where Mrs Stevens was the honoured guest of the American Iris Society at their annual convention in Los Angeles. Later Mr. and Mrs. Stevens spent a fortnight with us. Their penetrating understanding of Iris, broad knowledge of Horticulture and keen humour made their visit as delightful as it was memorable. This made me think to post a article on Jean Stevens Irises MIA (Missing in Action) and there is no better variety to start the new decade with than 'FINEST HOUR'. If you have seen this iris growing in New Zealand please do not hesitate to contact me. FINEST HOUR (Stevens 1958) E. 38"
FINEST HOUR (Jean Stevens, R. 1955). Sdlg. 1/cu. TB 36" EM. W4. S. white, F. deep even red; some haft venations. ((Naranja x Redmayne) x (Lagos x (Gudrun x (Lady Morvyth x Rangitira)))) x (Russet Mantle x Three Sisters)., Schreiner, Stevens 1958. Major hat tip, the first for the New Year to Carlos Ayento of Brighton Park Irises for the 1958 Schreiners Catalog Image and information.